all scattered on our precious soil!" we put you in our local jail! to make sure that your wreck is sound. "This bus is now declared too lame. get off our roads, for safety sake!" "I'll fine you just a little price." To spoil the law-enforcer's game. did take our travellers away. "Es wird dich immer weiter tragen." With heavy hearts we say goodbye. Well, after nine months and 30,000km, the ZebraSafari is finally over. We are in Frankfurt, in Germany, but the ZebraBus has been banned from driving anywhere in the European Union, thanks to the police in Stuttgart. But before I tell that story, I'll continue where we left off in our last newsletter, where we were in Budapest, Hungary, about to leave for Vienna. Before we left Egypt I had communicated with Michael Steinke of the Bullikartei (German vintage VW bus club), saying that we would be passing through Germany and that I would like to renew our acquaintance. When we broke down in Turkey I kept Michael updated and he responded by giving me a contact in the Bulli Club in Vienna and letting us know that he would offer us all necessary assistance once we reached Germany. We left Budapest on the Wednesday afternoon following the Easter weekend and the ZebraBus flew the 300km to Vienna. Ever since the breakdown in Syria she had been very temperamental, with good days and bad days, but she was in top form on the drive to Vienna. We arrived in Vienna in the evening and were unable to make telephone contact with the local Bulli Club people, so we slept in the car on a side street near the main railway station. In the morning we spoke to one of Michael's contacts, Edgar Rischer, and half an hour later he arrived with Etienne Monnier, the Bulli Club president, and they escorted us to Edgar's home, where we picked up his 1967 VW camper and drove in convoy to a hotel in the suburbs, owned by the family of his wife, Annie. There we met Annie and were given a traditional Austrian lunch. In the afternoon we met some of the other Bulli Club members and saw their buses. Our arrival in Vienna was perfectly timed, as the club was holding its monthly meeting that evening. Gisela and I made a video presentation about our journey to the club, and we enjoyed a great evening as guests of the Bulli Club. After the club meeting we went back to Edgar and Annie's apartment with some of the club members and sat up talking and having fun until the early hours of the morning. We got up late the next morning and enjoyed a leisurely breakfast with Edgar and Annie and another Bulli Club stalwart, "Dirty" Harald Minnich, who drives a fine 1959 ex-army bus. Although we spent only 36 hours in Vienna, it was one of the high points of our journey, thanks to the marvellous hospitality of Edgar and Annie and the rest of the Bulli Club. We had both been quite depressed ever since the ZebraBus broke down in Syria, but spending time with a group of such friendly and hospitable VW bus lovers really cheered us up. After brunch we said our goodbyes and hit the highway for Salzburg. We made a brief sightseeing drive around Salzburg at sunset, then drove into Germany, where we slept the night at a roadside rest stop. We awoke early the next morning, a Friday, and headed northwards on the autobahn. But the ZebraBus woke up in a bad mood, and the engine was running very badly, the worst since we repaired her in Turkey. Then we noticed that the oil leak that had started in Turkey had deteriorated from a steady drip to a stream. It was beginning to look as though we might not make it to Frankfurt and that we would have to call on Michael's offer of a trailer. We struggled on northwards, stopping regularly to top up the oil. The engine had lost power and begun to misfire, and it was stalling regularly. But still we struggled onwards, eventually reaching Stuttgart. And then we hit our worst bit of bad luck of the whole journey. As we took an onramp back onto the autobahn, we were pulled over by state police. The officer who pulled us over was young and seemed friendly and sympathetic, but his superior was ill tempered and took an immediate dislike to us and our old bus. We clearly offended everything he stood for. The cops immediately noticed the puddle of oil under our engine, and pointed out a small oil leak from the transmission. They told us we would have to accompany them to a roadworthiness testing station. 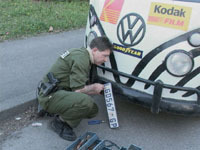 The standards required for a German roadworthiness certificate are extremely high and, even in her best condition, the ZebraBus would not have passed the German TÜV test. And it seemed that Zebi knew what was coming: about 2km later she gave up her long struggle and her heart broke, and all her oil fell out on the road. The cops called a tow truck and Zebi was carried to the testing station, where unsympathetic engineers in white lab coats prodded her and poked her and found her unfit to drive on Germany's roads. I was given a list of faults as long as my arm. And then the police said there was a problem with our insurance. We were under the impression that we had the required compulsory insurance, but it seemed that our policy was not valid for Germany. The ZebraBus was pushed out into the street and we were taken to the police station and charged with driving without insurance, which would appear, from the way we were treated, to be a particularly heinous crime in Germany. Back at the police station we were introduced to a friendly and sympathetic officer who handled the translation, but he had no power over the evil Officer SchutzStaffel, who was determined to throw the book at us. We pleaded ignorance and poverty, and our case was referred to a magistrate, who fortunately recommended leniency. We were fined 500 euros, which included the fee for the TÜV test. Although this was a fraction of what a German would have had to pay, it was still a huge amount of money for us, especially when added to the 150 euro we had already paid for the tow to the testing station. Then officer SchutzStaffel and his fresh-faced young trooper drove us back to the ZebraBus and seized the registration papers and the license plates, and left us stranded in the street. Zebi put up a bit of a fight when the cops took her plates, and refused to give up her front number plate. But no one can resist the full might of the police, and eventually the cops got their way with a large bolt cutter. Officer SchutzStaffel's parting words to us were that we could never again drive our car aywhere in the EU, and that our friend in Frankfurt had better come and tow our pile of junk away before the end of the weekend or the police would cart her off to a scrapyard. We had already called Michael Steinke from the police station, and he had agreed to come and rescue us the next morning with a trailer. By this stage we were both very upset, and Gisela crawled into the back of the bus to cry. Then I noticed that we were parked alongside a sports club with a restaurant and suggested we go there for dinner. Gisela replied that we couldn't afford it, but I said to hell with it, we can sit here and be miserable or we can give ourselves a treat, and anyway, what was another 20 euros after all that we had spent today. She agreed and we went into the restaurant. We got personal service from the owner, an Italian called Luigi, who cheered us up immensely. Luigi had witnessed the police confiscating our licanse plates and was aware of our situation. After we had eaten he said we could park overnight in the restaurant parking lot, and allowed us to use the sports club's showers and toilets. The next morning Michael arrived as promised, with Matthias Meyer, a fellow Bullikartei member, and the ZebraBus was quickly loaded onto a trailer and we began the 250km haul to Frankfurt. On route we stopped to refuel, and Michael refused to let me pay. Shortly aftrwards we dropped off Matthias at his home and were shown his 1965 Arcomobil, a very rare camping conversion of a VW bus. We arrived at Michael's home in Frankfurt in the late afternoon and met his wife Christa and their three sons, Sebastian, Christian and Marian, and their dog Samba, and were made to feel totally welcome. Then we sat down to tea and Michael quizzed us about our intentions. With our faithful ZebraBus no longer driveable, it was time to sell her and wind up our adventure. Michael immediately got on the phone to one of his fellow bus collectors, Thomas Gahl, and we made a date to meet him the next morning. When Thomas arrived the next day he bought the ZebraBus on the spot. Although the price was somewhat less than we had been hoping to get in London, the car was no longer in good condition and the amount was still a lot more than she was worth back in South Africa. In any event, Thomas paid us more than enough to buy our air tickets back home and we were very happy with the price. And there was something more important to us than money: over the past weeks we had been discussing how we would find a good home for our ZebraBus. Selling her was a bit like selling a member of the family, and we were concerned that the new owner would preserve her and allow her a graceful retirement, which she has surely earned after all we have put her through. And Thomas is the perfect person to take over Zebi. He has a large collection of unusual VW buses, and he assured us that he would preserve her "as is". He also said that any time we return to Germany we are welcome to come and visit her in his collection. After we had sealed the deal with Thomas, Michael loaned us a bus from his collection to drive around in. It is a 1967 former fire department double cab, with less than 22,000km on the odometer. It has been a pleasure and a privilege to drive around in a nearly new vintage VW bus. Michael's generosity has been amazing; I must say that if I owned a bus like that I would not allow anyone else to touch it, never mind drive it. In the evening the Frankfurt Bullikartei held its monthly meeting and once again Gisela and I gave a presentation about our journey. All the club members were ashamed and embarrassed at our treatment at the hands of the police. We had broken the rules, but all felt it was shameful that we, as guests in Germany, had been treated so harshly and not been given the opportunity to set things to rights. We will spend a few more days in Frankfurt disposing of our possessions and shipping my tools back home, then we will take a bus to Paris and London, where we will visit friends and family and attend to some business, before flying back home from London. And in the meantime we continue to enjoy the wonderful hospitality and generosity of Michael and the Steinke family. whenever we get good internet access.